Pieces of wood and a lot of ingenuity. Robert Tickner, a University of Mississippi Medical Center pediatric neurology patient and a Rosa Scott High School freshman in Madison, used both to make model MRI machines that can ease young patients’ anxiety about imaging. Part of Robert’s Eagle Scout project, the models are already reducing the numbers of pediatric patients needing sedation for imaging. Often, young patients need sedation due to fears of the imaging machine as well as the need to be still for the MRI, which can take 45 minutes or longer. With less anxiety, though, that need is diminished. The models, sized for a small doll or action figure, allow children, through play, to get acquainted with MRI procedures. The idea for the project was sparked by Robert’s own experience as a Batson Children’s Hospital neurology patient. “I wanted to do something that would help patients at Batson,” he said. At first thinking of books, Robert talked with child life specialist Tiffany Key and learned efforts were underway to make imaging easier for young patients. The models involve Robert’s hobby of woodworking as well as his own MRI experiences. While sedation is used to keep children still and comfortable during imaging procedures, it is not without risks. The American Academy of Pediatrics holds that careful preparation can reduce the need for sedation in diagnostic imaging. The shoebox-sized models have been at UMMC only a few weeks, but they’re already making a big impact, imaging technologists say. Troy Webb has an appreciation for the donation, as an MRI technologist as well as a woodworking enthusiast. “These are really well-made,” Webb said of the models made by Robert and volunteers in the project. 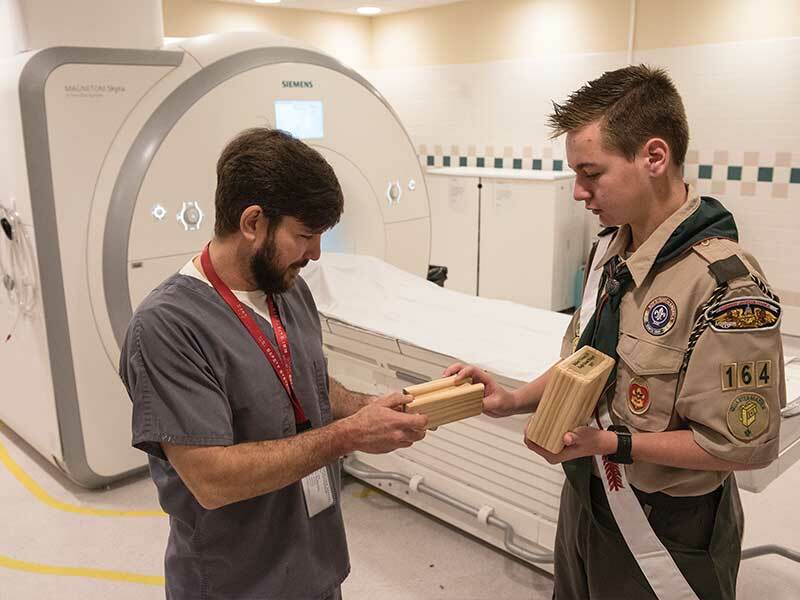 MRI technologist Troy Webb, a woodworker in his off hours, takes a look at the wooden model MRI machine made by Tickner. Showing his skills in leadership and delegation, Robert directed his father, Bobby Tickner, and several fellow Boy Scouts in replicating the wooden models. Pediatric imaging is done at UMMC’s adult hospital, but plans for the Children’s of Mississippi expansion project include an imaging center just for young patients. Construction of the tower, which will be adjacent to Batson Children’s Hospital, starts next month. Robert’s models, as well as more child-friendly imaging equipment and surroundings, will be used to make imaging easier for children, and in a growing number of cases, sedation-free.